The Davis 7714 Weather Radiation Shield is the most effective passive shelter available. Protects your Temperature or Temperature/Humidity Sensor from solar radiation and other sources of radiated and reflected heat. Multi-plate construction for maximum airflow. Assembly required. 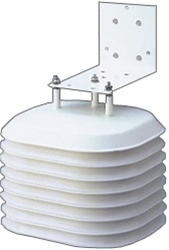 The Davis 7714 Weather Radiation Shield may be used with Sensor Mounting Arm or mounted on metal pipe or wood surface. I got this product for my friend Ray Muller, who doesn't have internet access to be able to order products online. The whole process of ordering and receiving this product went very well, we continue to be impressed with the speed of delivery and the excellent shipping care taken to get the product to its destination 100% safe and secure and not damaged at all.